Even the best team leaders have moments of wondering if their team is really ready for the next critical incident. In the line of duty, whether it be public-safety like law enforcement or emergency response, or an industry with potential for dangerous accidents like construction or oil and gas, there will be the inevitable critical incident on the job. These can result in physical injury or even fatality, but also in a more difficult to detect, and often long-lasting, other type of injury. Post-Action Strategic Debriefing addresses a critical incident immediately after, using a process devised from several different proven techniques - the military's after-action review, critical incident stress debriefing and counseling & therapy intervention techniques. This process focuses on preventing trauma effects from the incident as well as creating positive momentum for the team to be stronger, more united and more mentally healthy following the incident. More importantly, though, is being prepared for an incident. We all know and understand how important good physical health can be when facing a physical difficulty. Someone who is exhausted and weak, possibly ill, will not be able to fight off an attacker like another who is strong, well, and in good, conditioned, physical health. Mental health and emotional health are equally important, and it is widely believed that the three are closely related and affect each other. Someone who is mentally unhealthy, such as having a stress disorder or addiction, will also most likely have related physical illness (ulcers, liver illness, etc.) as well as emotional illness. The best way to get your team, and the individuals on it, best prepared for any type of oncoming attack is to get them healthy. Physical health and strength are important. Mental health follows the same guidelines, but deals with mental capacity and the brain's ability to function well. If someone is able to think fairly clearly, cope with regular life situations, including stressors and challenges, be flexible with his thinking, and solve basic problems by thinking of viable solutions, then he or she is probably considered to be in a good state of mental health. Based on these guidelines, we can also understand the meaning of emotional health. If someone is able to function well emotionally, this means they are in good control of their emotions and also the behavior that frequently accompanies our emotions. If a life challenge arises, an emotionally healthy person will manage his emotions through the challenge, and then will have some resilience and bounce back to his normal emotional level pretty quickly after the challenge is resolved. We know how to strengthen our bodies physically. How do we strengthen mental and emotional health? It's important to try to achieve a balance by lowering stress and increasing positive activities. Participating in positive activities like exercise, fun, hobbies, doing good deeds for others, taking the time to enjoy family and friends, and positive thinking overall. Positive activities like these can release endorphins (chemicals) into your system, aiding your ability to feel less pain and to have controlled emotions. Endorphins are chemicals that originate in different parts of the body like the brain and nervous system, the spinal cord, and the pituitary gland. They work as neurotransmitters, connecting to the opioid receptors in the brain that are mostly responsible for blocking pain and controlling emotion. These endorphins are naturally created by the body and work just like a narcotic such as heroin or morphine. The endorphins in the body are able to block pain, but also create feelings of pleasure. It is believed that our neurotransmitters can be “trained” to connect better, helping us to be stronger emotionally, just like bodies can be trained physically to function better. The theory is that if an individual is depressed, emotionally imbalanced or negative, the neurotransmitters are not connecting properly. Imagine a spark between two items that just isn’t connecting – the spark misses the second item and never connects the two. This is how neuro transmitters work, sort of – when one is thinking positively and functioning in good mental and emotional health, the neurotransmitters are connecting. The training of these connections then is by purposely making the neurotransmitters connect, training them to then do this on their own. The more positive thoughts one focuses on, whether reading them, repeating them, or just continuously focusing on positives all day long, the more often the neurotransmitters are connecting. The more they connect, the more they learn to naturally connect. The more endorphins released, and the better the neurotransmitters are connecting, the more mentally and emotionally healthy the individual. Not having good, strong emotional and mental health can affect an individual by making them more prone to illness, more susceptible to emotional outburst of anger, fear or irritability. It can also lead to substance abuse, hopelessness and a disintegration of relationships, jobs, and the ability to function normally in society. By strengthening the emotional and mental health, one becomes more resilient and better able to cope with stressors that arise. This makes for less unpredictability, better focus, and on the job, fewer accidents. If your team is strong physically, mentally, and emotionally, they will better react and respond to any incident. Ms. Morgan is an instructional designer, trainer and strategist via Academy Hour, a training provider offering courses to law enforcement, first response teams and business groups. She is pursuing a Doctorate of Education degree with a specialization in curriculum and teaching, has earned a Master's degree in Counseling, and holds a Bachelor's of Science in Behavioral Sciences. She previously served as the Training Officer for the Oklahoma State Bureau of Investigation, and as an Instructional Systems Designer and Trainer for the Federal Aviation Administration. Additionally, she currently serves as the corporate training developer for DC-based Changeis, Inc., a federal contract services provider. Ms. Morgan writes/publishes therapy resource workbooks & training materials, and serves as a subject matter expert and presenter of leadership & mental health training sessions for the International Public Safety Association. Ms. Morgan also serves as a curriculum developer and instructor of mental health courses for the Council on Law Enforcement Education and Training in Oklahoma. She is a certified trainer for Applied Suicide Intervention Skills Training (ASIST), and is trained as a QPR (Question Persuade Refer) trainer as well as a Crisis Prevention Institute Non-Violent Physical Crisis Intervention trainer. Additionally, she is Oklahoma Supreme Court certified as a civil mediator, and she has achieved Mensa membership status. Seeking mental health resources after a critical incident should be viewed the same as an individual going to the doctor or hospital after being physically injured. Remind your team that the more they are willing to use resources, the stronger they will end up being as an individual as well as a valued team member. Here are five post-action steps individuals on your team should take to avoid trauma after-effects. 1. Begin discussions. Gather together and discuss the trauma of the event that just occurred. My workbook has a script for leaders to use to explain what trauma is, how it occurs and what effects it can have. This process brings the group together and helps them to know that any reactions they are having to the incident are normal and acceptable. 2. Expectations versus reality. Discuss what was supposed to happen, what actually happened and compare the two. Then you must discuss what was going right and should be repeated in the future. Finally, you must discuss what could be improved upon. 3. Positive reframing. This is a process of story-telling where individuals tell their story of what happened, but learn to take out blame, anger, resentment by removing or editing small portions of the story, keeping all the facts intact, so that it is neutralized, and fact-based. This prevents resentment and lasting negative effects down the line. 4. Getting back to center. This part of the process helps the group come back together as a team and creates a blank slate, a fresh start for going forward. 5. Follow-up plan. The Post-Action Strategic Debriefing process is a first-aid type plan immediately following a critical incident. But long-term follow-up and care resources are discussed which need to be used by team members, to help prevent PTSD and other residual effects which will weaken the mental, physical, and emotional health. By using follow-up resources, the individuals circle back around to the preparedness stage by getting themselves strong in all 3 areas once again. Mental and emotional wellness and strength are just as important as physical health and strength, and can be trained and prepared for in the same way. Ms. Amy Morgan is an instructional designer, trainer and strategist via Academy Hour, a training provider offering courses to law enforcement, first response teams and business groups. She is pursuing a Doctorate of Education degree with a specialization in curriculum and teaching, has earned a Master's degree in Counseling, and holds a Bachelor's of Science in Behavioral Sciences. She previously served as the Training Officer for the Oklahoma State Bureau of Investigation, and as an Instructional Systems Designer and Trainer for the Federal Aviation Administration. Additionally, she currently serves as the corporate training developer for DC-based Changeis, Inc., a federal contract services provider. Ms. Morgan writes/publishes therapy resource workbooks & training materials, and serves as a subject matter expert and presenter of leadership & mental health training sessions for the International Public Safety Association. Ms. Morgan also serves as a curriculum developer and instructor of mental health courses for the Council on Law Enforcement Education and Training in Oklahoma. Ms. Morgan is a certified trainer for Applied Suicide Intervention Skills Training (ASIST), and is trained as a QPR (Question Persuade Refer) trainer as well as a Crisis Prevention Institute Non-Violent Physical Crisis Intervention trainer. Additionally, she is Oklahoma Supreme Court certified as a civil mediator, and she has achieved Mensa membership status. Millennial-aged police officers are quickly gaining a large percentage of police employment positions (Szoltysik, 2014). They expect high workplace satisfaction (Herbison & Boseman, 2009) and this generation of sworn police officers are the future of policing. Police organizations could benefit by identifying factors for Millennial-aged police officers for maximum workplace satisfaction. Contemporary generational literature identified employees born since 1980 as the Millennial Generation or Generation Y (Barford & Hester, 2011; Crumpacker & Crumpacker, 2007; Howe & Struass in Balda & Mora, 2011). Research in the private sector has shown the impact of generational differences from a workplace satisfaction viewpoint, which directly correlated to business practices reflecting organizational success and failure (De Muese & Mlodzik, 2010; Greengard, 2011; Hira, 2007). Current public-sector research discovered leaders have a responsibility to Millennial employees to provide satisfactory workplace environments, as current practices are not retaining the best talent (Kane, 2011). This generation, those born since 1980, is willing and able to fulfill the duties of public service (Della Volpe, 2010); however policy makers need to identify increasingly beneficial workplace environments for greater employee effectiveness. The rigid, policy-laden, pseudo militaristic, culture of policing must adjust to the newest generation (White & Escobar, 2008) and improve the current low satisfaction often found in Millennial-aged employees (Eldridge, 2012; Wasilewski, 2011). Research has been conducted on the perceptions of workplace satisfaction for Millennial-aged employees, but policing offers a vastly different work culture to study. Workplace satisfaction contains internal and external factors for individuals. According to Frederic Herzberg’s Two-Factor Theory for employee satisfaction, internal factors such as personal growth and happiness are known as motivators and external factors such as policies and pay are hygiene factors (Guha, 2010). Proper identification of how factors satisfy employees is important for leaders to provide motivating work environments. Lublin (2010) suggested the real problem may not be the generation, but the possibility current management does not manage or lead Millennials for prominence. Current police culture appears to be old practices disguised as best practices and it is postulated a more satisfying workplace environment could be found for Millennial-aged officers. Johnson (2011) reported that employers should examine their current work climate and identify methods of satisfaction that allow Millennials to perform best. Workplace environments such as permission to think and work outside the traditional constraints of the current organizational culture are most effective (Behrens, 2009). 1. What specific factors draw Millennial to work as police officers? 2. What specific workplace factors increase job satisfaction for Millennial-aged police officers? 3. What specific workplace factors decrease workplace satisfaction for Millennial-aged police officers? 4. What specific workplace factors promote workplace retention for Millennial-aged police officers? Many 911 calls are received after something serious was discovered, just occurred or in progress. Because of this, callers tend to be amped up and emotional. We give basic instructions when necessary, but feel completely helpless until help arrives. Sometimes our best effort isn’t enough. Thirty seconds feels like thirty minutes. Once help arrives, we are off to the next call without knowing the outcome of the previous call. 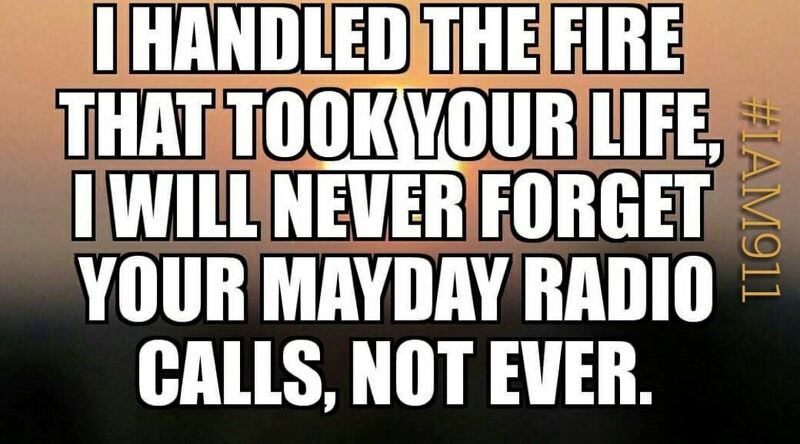 For first responders, there are things that can’t be unseen and there are some things that call-takers can’t unhear. Listening to someone’s last words or breath is forever etched within. We take calls from individuals who don’t speak English. When time is of the essence, the time it takes to locate a means of translation can mean life or death. We ask questions based on pertinent information that we need and then more questions based on those answers. During most shifts, 911 dispatchers or call takers take verbal abuse from callers who are not current fans of the police, but they want help and we make sure they get it. Callers are easily frustrated as they don’t necessarily understand our line of questioning. We often are asked by callers, “Why are you asking these questions, just send me the help? !” We do our best to remain calm when the caller on the other end of the line may be in imminent danger or struggling to stay alive. The average 911 dispatcher or call taker sits for eight or more hours with the possibility of a short break, but nothing is guaranteed. Depending on the agency, some individuals work eight hour shifts with rotating days off, some work 12 hour shifts and many work well over 40 hours per week due to overtime needs. We work 24/7. Most 911 dispatchers or call takers do not get weekends or holidays off unless they have enough seniority to work day shift regularly. Unless 911 dispatchers or call takers work a regular shift time, it is extremely difficult to maintain an exercise routine. Good physical health is very important for this work – being able to control the adrenalin or stress from calls plus the sedentary role of the position wreaks havoc on us. We must take care of ourselves. Basically, any kind of sleep routine is unheard of. We often take just enough of a break to run to the bathroom or heat up food that usually gets cold as we take bites between calls. Many of us rely on food delivery because packing our lunch can be time consuming- especially after working overtime before or after a regular shift. We consider our colleagues, on our side of the radio and on the street, to be an extended family. When one is injured or lost in the line of duty, we all feel it. Deeply. We constantly check officers' status and make sure they have sufficient if not more than enough backup while on a run. We do what they ask of us and document as much as possible. We listen for radio traffic while receiving phone calls and messages from officers on the computer - sometimes at the same time. We handle foot and vehicle pursuits while coordinating with other nearby agencies. We can be given minimal information about a person and become masters of needle-in-the-haystack research and locate a full name, date of birth, SSN, address and driver’s license photo. Our multitasking skills are like a superhero power. Our downtime, if there is any, is spent on reviewing updated Standard Operating Procedures because policies are always changing. Our view of the world can become a lot more cynical and our humor slightly dark. We know what really goes on in our jurisdiction, not just what the media decides is newsworthy. It’s hard to know details that you legally can’t give out and it’s hard to see the media reporting on something that puts a misleading spin on the facts. 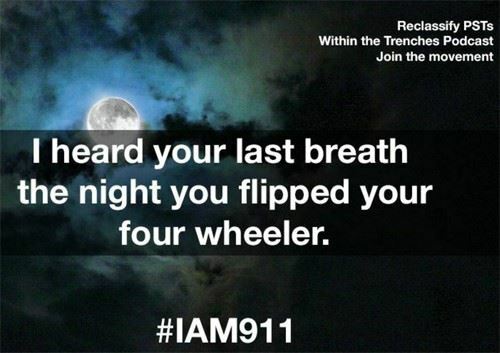 This is just a glimpse into the life of a 911 dispatcher. I have had encounters with people who, when they found out where I worked, shared their experience during a time they needed to call 911. Some were positive stories, praises and “thank you for your service.” Others were less positive. Regardless of their individual experiences, I usually encourage them to contact their local agency for a tour of the 911 center and to even sit with a dispatcher. This job can certainly take a toll, but most of the good days outweighs most of the bad days. A lot of people are familiar with the thin blue line, which represents the police and the dangerous line they walk every day, but 911 dispatchers and call takers are a lifeline for citizens and officers alike. 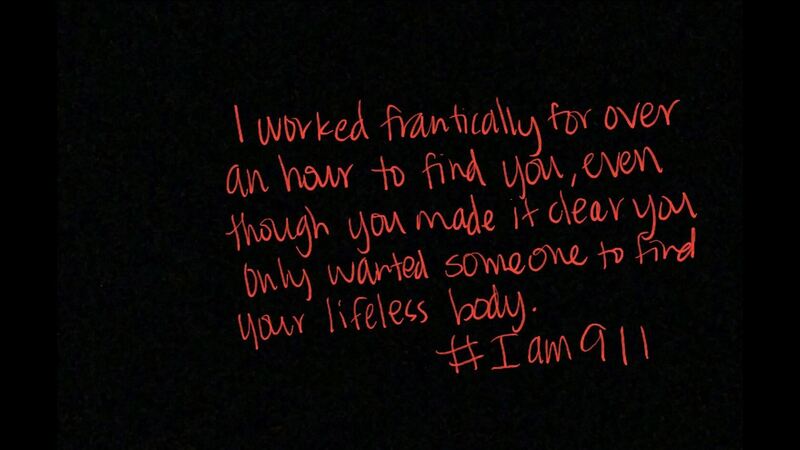 What is the story behind the #IAM911 movement? We all know how unpredictable and fast-moving law enforcement can be. We can all recall the days when officers carried handhelds the size of a brick, cell phones were an expensive status symbol, no interconnectivity to personnel was available, and long trips back to the station to input the day’s data entry was a tedious and dreaded task. Who could have predicted the law enforcement workflow of the future — reliable and continual communication, instant access to critical records, GPS guidance, e-citations, fingerprint authentication readers, smartcard and magnetic card readers, body-worn cameras, in-vehicle printing, on-scene incident reporting, barcode and RFID readers, automatic license plate readers and law enforcement oriented apps and software — these advancements have made it possible for officers to have a real-time crime center. Whether you decide to implement a tablet or laptop solution into your department is completely dependent on the necessary requirements to create a real-time situational awareness crime center for every officer. Within the past five years’ tablets have become an evolving form factor, some pledging the case for tablets becoming the mobile computing tool of the future for law enforcement, gaining momentum into the market so strongly laptops are being thrown into the abyss of the past. However, opinions differ on whether a tablet can outperform the old tried and trusted mobile workstations via a laptop or notebook, as both have their individual advantages. Keep reading on to discover the advantages of both mobile solutions — tablets and laptops for law enforcement. Why should you choose a rugged tablet solution for your department? The choice between equipping your workforce with laptops or tablets is dependent upon whether officers are in a patrol car, at a desk, on foot or in the office. Do officers want to take the device outside of the vehicle? Tablets are a highly effective tool for police motorcycles which can be mounted on handle bars or in the saddle bag, as well as patrol cars, SWAT teams and investigators. Detectives can use rugged tablets to take on-scene film footage and images without requiring expensive digital cameras to capture evidence. Tablets are light weight and small enough for handheld use and take up minimal space inside police vehicles. Specialized uses for tablets include signature captures, barcode scanning for ID verification and VIN number scanning, field interview creation, evidence photography, plus the ability to exit a vehicle while filming real-time video of emergency situations to properly assess the requested resources for dispatch. Officers can take a tablet from the vehicle to the street and back to the office to be docked and used as a desktop PC — this seamless transition is the definition of true mobile computing. In the past, display real estate has been an issue with officers using tablets for their main computing solution but today tablet screen size has become comparable to the laptop or notebook and even offer digitized screens for glove-touch and sunlight viewability. What about data entry? Many rugged tablets have backlit companion keyboards that seamlessly snap-on or bolt-on for quick typing ability. Rugged tablets are a practical solution offering complete mobility allowing for routine work to be more streamlined in the field, an imperative element in creating intelligent, real-time crime centers. Not every rugged laptop is created equal and this is especially true when deciding which laptop solution to implement into your department. Many rugged laptops are purpose built for public safety and offer touchscreens for tapping and zooming, stylus pens for signatures and on-screen entry, a thin and light design, and ergonomic features such as swivel screens to be viewed by individuals both on the driver and passenger sides of the car. What about removing the device from the vehicle? Many officers never remove their device from the police vehicle and when given the choice, would rather not. When a mobile device is removed from the vehicle such as a rugged tablet the chance of the device being broken, driven over, stolen or misplaced is highly likely. When this happens, the device must be replaced which can be very costly over time. An important aspect of a law enforcement laptop or notebook is the proper vehicle mounting solution. The last thing an officer needs is a large bulky computer impeding the process and increasing risk. Vehicle docking stations and consoles keep rugged laptops charged and ready to go while providing shock absorption and stability. Rugged laptops will continue to evolve aiming to make jobs more efficient and productive — we see this today in the adoption of the two-in-one hybrid notebook which can be used as a laptop or tablet. For those who need the stability of a laptop, yet the light weight flexible form factor of a tablet, a two-in-one device may be the right solution for your department. When the time comes to implement new and advanced technology whether it be a tablet, laptop or a two-in-one device, police computers must be durable, high performing, easy to use with custom features and options, along with a realistic price point — an equation for value and return on investment. The mobile solutions experts at Group Mobile work with police departments nationwide and can assist you in determining the best equipment for your application and budget. The Millennial Generation is defined as a cohort of individuals born since 1980 (Barford & Hester, 2011; Crumpacker & Crumpacker, 2007; Howe & Struass in Balda & Mora, 2011). They are the latest generation impacting the workforce to include America’s police departments. Researching the most recent generation of employees affecting the workplace is not unique, but identifying the root causes of workplace satisfaction in policing through the Millennial voice is necessary for high customer service and retention (White & Escobar, 2008). Contemporary literature supports the proposition that Millennial employees behave differently in the workplace, but most employers apparently fail to integrate the needs of successive generations (Behrens, 2009). Before even being hired, traditional thinking in policing instructs new employees to adapt to the existing organizational technology and culture or go away (Greengard, 2011). This workplace model is usually supported by police-themed television and movie culture, and it does not provide the best satisfactory workplace environment for high-speed Millennials yet to be immersed in the police culture. Creating the best environment for Millennials to want to become police officers and use their natural talents will increase workplace satisfaction and retention (Altes, 2009, Crumpacker & Crumpacker, 2007, Ekblad & Hathaway, 2010, Ferri-Reed, 2010, Siegfried, 2008). Barford & Hester (2011) explained the work attitudes of Millennial employees are consistently compared to the two previous generations in the workplace; Baby Boomers and Generation X. The authors stated it is incumbent upon the leaders of the two older generations to provide the necessary workplace environment for their youngest employees to not only succeed but thrive. As discussed earlier, Millennial employees viewed workplace responsibilities and compensation as lower factors for job satisfaction with personal and professional advancement potential and free time as higher factors. This workplace attitude is clearly different than Baby Boomers and Generation X. The common and rigid, rules-laden, command and control workplace currently in policing and legislated by the Baby Boomers and Generation X leaders does not necessarily satisfy Millennial employees. The Pew Research Center (2010) published a study which identified specific Millennial Generation values, attitudes, and experiences. Technologically proficient, constantly connected to social groups through the internet, and highly educated describes this latest generation of employees (Taylor & Keeter, 2010). When compared to Arizona Peace Officer Standards and Training Board’s standards for educational requirements, the Millennial Generation generally exceeds the minimum qualifications of high school diploma or general equivalency diploma with some college (AZPOST, 2013). Barford and Hester (2011) suggested government work may present too few workplace opportunities and promotions, therefore failing to fully engage Millennials. The authors also stated Millennials may simply be bored with their current level of responsibility provided by their government jobs. Workplace challenges and genuinely solicited input are important to maintain Millennial employee engagement. A much higher level of flexibility when communicating to bosses and a valid voice heard in the workplace is a Millennial assertion (Kaifi et al., 2012). Millennials wish their voices to be heard by their bosses as well as their teammates as factors for workplace satisfaction (Ekblad & Hathaway, 2010). Employers are willing to advertise, recruit, hire and train Millennial employees, yet appear unwilling to place them on committees or allow them organizational input. Therefore, the best talent is not always retained in organizations due to overly-stringent government workplace polices (Kane, 2011). Every Millennial-aged officer can be a leader in their organization to help propel workplace satisfaction of their peers (World Future Society, 2007). The Millennial Generation may have to take the lead in making workplace changes to provide the most satisfying workplace environment rather than waiting for current managers to act. These implications were acknowledged in this research through identification of Millennial workplace satisfiers and motivators. Millennials rank benefits, praise/recognition, personal happiness as well as flexibility high for job satisfaction, and it should be noted that job security ranks at the bottom of their list (Trulock, 2011). Due to the recent blending of the industrial and mechanized era with the computerized information age, choices of contemporary American industries are plentiful for Millennials. Police leaders must be aware of the motivators for Millennial-aged employees, as Millennials today have choices of employers as well as industries to provide the job satisfaction they seek. Police organizations are not just competing for Millennial-aged employees with other police agencies. Millennials are willing to look across multiple industries to identify the employer and industry that meets their workplace satisfaction needs. Hira (2007) reported that Millennials have no reservations about quitting a job that does not satisfy their list of needs and moving back home with their parents to search for another job. There appears to be no stigma associated with such a decision for the Millennial Generation. Technology is one of the great satisfaction dividers between Millennials and other generational cohorts. About 75% of Millennials are connected to the internet every day, while only 40% Baby Boomers tune in as often (Taylor & Keeter, 2010). The constant use of mobile cellular technology can be a point of contention for Millennials and their older bosses. The overwhelming majority of Millennials prefer to communicate via text messaging at 87% (Cekada, 2012) and they often prefer to only communicate in this manner. This communication divergence can cause organizational conflict that leaders must better comprehend for organizational effectiveness. Technological communication in the workplace must be further researched to identify workplace behaviors and tools to improve communication and satisfaction. The technological, external hygiene factors for Millennials in the workplace are plenty. Because Millennials were raised during the digital age, they have a unique and competitive edge with contemporary communication and computing (Kaifi et al., 2012). Technology often increases the speed of decisions and deliverables, and this quickened pace can often result in Millennial employees appearing to be impatient and unsatisfied to older generations (Bannon, Ford, & Meltzer, 2011; Johnson 2011). The advanced technological skill of Millennials sets them apart from previous generations in the workplace, but exists to support high job satisfaction. Proactive organizational leaders could blend technology ideas from Millennial employees in communication decision-making and budgets. Millennials also enjoy working in teams as a job-context hygiene factor. Millennial employees have most likely been placed in team atmospheres by their parents their entire lives to this point. Working together to problem-solve has been the main learning point of their schooling, sports and extracurricular activities. Therefore, Millennials tend to look down upon the individualistic cut-throat political and bureaucratic rigor of the previous generations (Emeagwali, 2011). The author stated Millennials prefer workplace collaboration to the compromise of politics. A more relaxed dress and workplace atmosphere are highly desired by Millennials (Welsh & Brazina, 2010) through dressed down work days or more relaxed work uniforms. A quick look at the laidback workplace environments of Google, Red Bull, Facebook and Zappos reveal employers very well known to Millennials who offer extremely informal workplace environments (Dunlap, 2014). Paramilitaristic workplaces may have to reexamine their utilitarian dress code to attract and maintain highly satisfied Millennial-aged police employees. Some intrinsic workplace motivators for Millennials also exist. Johnson (2011) interviewed Millennial employees and discovered new information. Millennials embraced social networking as they appear always plugged in and using the latest technology. They strive for self-improvement and advancement through employer-provided training, and they want to reach their career goals much faster than previous generations. This is often interpreted as impatience and entitlement to older generations of bosses and coworkers. A work-life balance is also mandatory for Millennials. Work and the environment must be fun. They expect to work collaboratively with their bosses rather than just for their bosses, which can be a challenge for some older generation leaders. All of the extrinsic factors and intrinsic motivators for Millennial-aged employees are important for organizational leaders to know, because research indicates employees in their twenties can be expected to stay in one position for just 1.1 years (Johnson, 2011). This high-level of turnover will negatively affect organizations through budgets and reduced customer service unless transformational leaders identify the issues and make the appropriate adjustments. The #IAM911 movement began as many movements do; in protest. A former 9-1-1 Public Safety Telecommunicator and current podcast host birthed this movement to encourage a change in the taxonomy of emergency dispatchers. Public Safety Telecommunicators are currently classified as “Office and Administrative Support Occupations” under the U.S. Government’s Office of Management and Budget’s Standard Occupational Classification Policy Committee. This classification essentially suggests that 9-1-1 dispatching is more of a clerical role than a responsive or protective one. The #IAM911 campaign is an effort to spread the message that 9-1-1 telecommunicators do far more than clerical work, and are in fact first responders too. Ricardo Martinez II was a 9-1-1 dispatcher for almost 13 years. He now runs a highly popular podcast on Facebook titled, “Within the Trenches”. The mission of this podcast is to share, with the world, the real-life stories of what it takes to do the job of a 9-1-1 PST. Through this online community, Ricardo saw the perfect opportunity to reach the masses and display his support for the reclassification of PSTs. He began by sharing his own story, which then inspired others to participate. 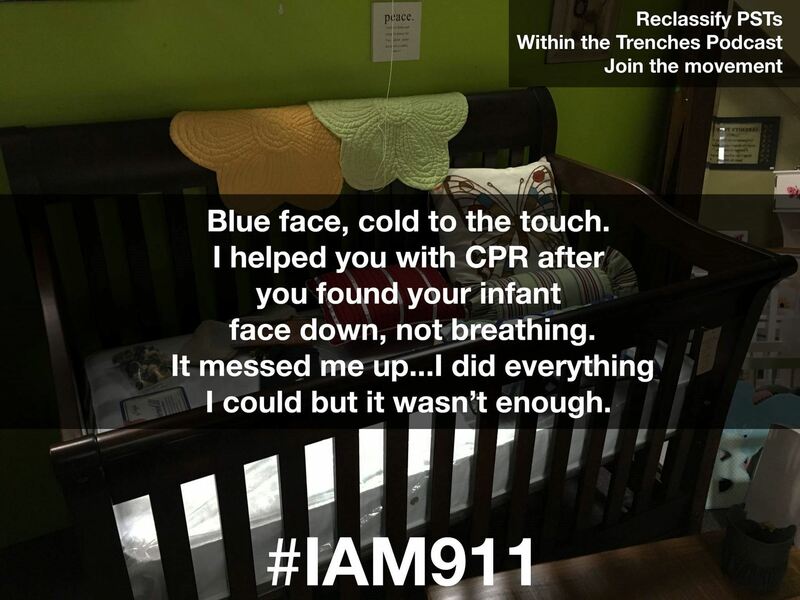 It wasn’t long before the meme-style crusade began and dispatchers from all over the nation were sharing their stories too, across all social media platforms, and all with the hashtag of #IAM911. 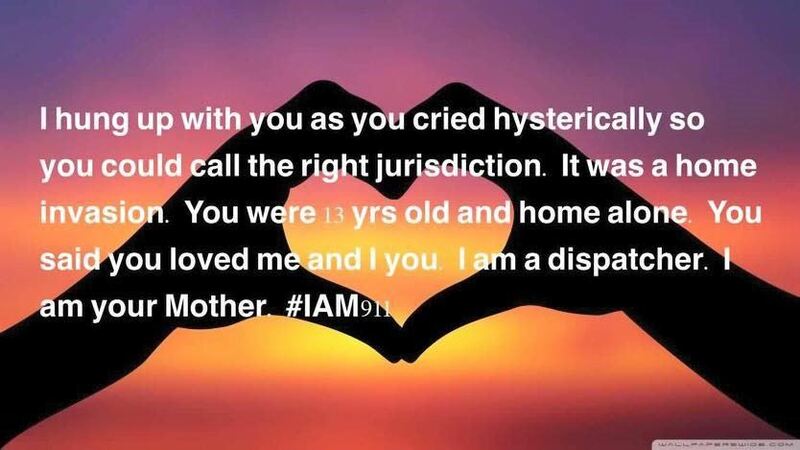 Individuals were able to share some emotional moments of their personal, and often life altering interactions with 9-1-1 callers. Like giving CPR instructions over the phone (this is one of Ricardo’s personal experiences too). Or talking someone through their attempted suicide. They were also able to share the bond and connection they have with their brothers and sisters out in the field and the horrific moments when they weren’t able to help. They were even able to share intimate stories involving their own families. Every single one of the short stories delivered a very powerful message; PSTs do more than just answer a phone. The #IAM911 movement affects and involves the entire public safety community. Every single person in this profession is working together to send help to those who have to dial 9-1-1 and to keep our responders safe while doing so. One cannot exist without the other. If we are a community that is constantly striving to better ourselves (as we should be) then we need to have the same standards and expectations set forth for all public safety employees. We can help each other out by encouraging and/or assisting agencies to adopt some sort of protocol so that the majority of 9-1-1 centers are actually giving lifesaving instructions instead of just answering the phone and sending help. This is said to be a possible reason for the remaining “clerical” classification. We can support local and national associations and/or chapters that offer training guidelines and continuing education courses. We can work more diligently in ensuring the civilian population understands the capabilities of the PST and what lifesaving advice can be given over the phone. The buy-in, however, must start from the top. #IAM911 is yet another valiant effort by 9-1-1 dispatchers to gain the professional designation and respect that they earned. It is time for the rest of the public safety world to join us in the belief that not only are 9-1-1 PSTs first responders, they are in fact the first, first responder. Unlike other non-profits, the IPSA brings together the entire public safety community. Our membership represents law enforcement, fire service, EMS, telecommunicators, emergency management and allied emergency responders. With there being so many non-profit membership associations out there, we wanted to give you three reasons to join the IPSA today (and refer others if you are already a current member). The cost to join the IPSA begins at $25 per year. With this low-price, members receive discounts to our web-trainings and in-person events. For example, IPSA members receive free registration to our webcasts (a $50 value) - this alone shows an immediate return on investment. In addition, IPSA members receive 25% off our web-workshops, discounts to our on-demand video library and discounted rate to our upcoming conferences. Our web-trainings are year-round. In addition to the professional development opportunities we offer through our trainings, the IPSA is rolling out several new committees and is continually recruiting members to join these committees to develop policy, research, web-trainings and articles for the public safety community. We currently have eight committees that are all peer-to-peer collaboration, and we're recruiting for new committee chairs for several other soon-to-be created committees. Everyone in public safety has lessons learned to share and we offer two types of publication opportunities that will generate national and international exposure. But more importantly, these are opportunities to help your brothers and sisters who serve their communities. All IPSA members can submit to the IPSA Journal and become Bloggers. The IPSA Journal is a new public safety peer-reviewed journal that is governed by the Peer Review Committee (applications are being accepted through 2/28 for new committee members). The IPSA Blog is less rigorous than the journal, but still a great opportunity to submit thought-leadership articles for publication consideration. These are just three reasons to join the IPSA. We strongly encourage individuals who haven't joined yet to sign up today for our two year membership to give yourself an opportunity to get involved and give us time to show you why becoming an IPSA member is an important step in bringing together the public safety community. For individuals who are members, we invite you to encourage a colleague to join today. Tell your leadership about us and ask them to send out a departmental email. Post this article on social media. Afterall, being a member is more than paying dues, it is about giving back and helping us grow so we can provide programs and services that facilitate interagency collaboration. We depend on critical infrastructure every day. Our ability to travel, to communicate with friends and family, to conduct business, to handle our finances, and even our ability to access clean, safe food and water are all reliant upon our Nation’s critical infrastructure networks and systems. These essential services that underlie daily life in American society are increasingly being run on digital networks. Every day, people connect to the national grid without even realizing it from their smart phones, computers, and tablets. As a result, these critical systems are prime targets for cyber attacks from those seeking to cause our country harm. Seventy percent of companies responsible for the world’s power, water, and other critical functions reported at least one security breach, throughout a 12-month period, that led to disruption of service or loss of confidential information, according to the Ponemon Institute in 2014. Resilience of essential systems and assets, from power grids to banking systems, is vital to our national security, economy as well as our public health and safety. As the Department of Homeland Security transitions from October’s National Cyber Security Awareness Month (NCSAM) into November’s Critical Infrastructure Security and Resilience Month (CISR), we focus on the critical mission of defending our Nation’s critical infrastructure from cyber threats. Each November, DHS highlights the efforts between federal, state, local, territorial, and tribal governments and private sector partners to protect and secure the infrastructure Americans rely on every day to communicate, power, transport, and otherwise support our way of life. Every day, DHS works with critical infrastructure owners and operators to better secure our systems from cyber threats. The Department’s C3 Voluntary Program supports industry in increasing cyber resilience, promotes awareness and use of the Cybersecurity Framework, and encourages organizations to manage cybersecurity as part of an all hazards approach to enterprise risk management. For more information, please visit https://www.us-cert.gov/ccubedvp. Just as we all rely on critical infrastructure, we all play a role in keeping it strong, secure, and resilient. We can do our part at home, at work, and in our community by being vigilant, incorporating basic cyber safety practices into our daily routines, and making sure that if we see something, we say something by reporting suspicious activities to local law enforcement. The Stop.Think.Connect.™ encourages all Americans to take the following steps to play their part in securing our critical infrastructure. Keep a clean machine. Having the latest security software, web browser, and operating system are the best defenses against online threats. Keeping the software on your device up-to-date will prevent attackers from being able to take advantage of known vulnerabilities. Turn on stronger authentication. Stronger authentication requires that you use your password in conjunction with an additional piece of information (commonly a one-time PIN sent to your mobile device). Even if cybercriminals have your password, they won’t be able to access the account without the second component if stronger authentication has been used. Visit www.LockDownYourLogin.com for more information on stronger authentication. What does cybersecurity have to do with watching the Super Bowl? Use only reputable online retailers. Looking for a ticket to the game or official Super Bowl merchandise? Make sure the retailer is legitimate and that their website provides protection for online purchases. Look for the padlock symbol near the website address or for URLs that start with "https" or "shttp." Stream carefully. For those watching the game online, make sure to use a legitimate website. Questionable websites may expose your computer to malware or other security risks to your privacy or personal information. Be wary of public Wi-Fi. If you’re following the game online and in a public space, be careful about public Wi-Fi networks. Don’t conduct any sensitive activities, such as online banking or shopping, while connected to public Wi-Fi. Think before you act. Be wary of "too good to be true" deals. Free tickets, cheap team merchandise, cheap collectibles – if a deal sounds too good to be true, it probably is. Slow down and think twice before clicking on such deals. It’s always important to read the fine print and see if these advertisements are a genuine touchdown rather than a malicious fumble.